WASHINGTON, DC, May 31, 2013 (ENS) – Federal officials today designated 28 trails as national recreation trails, adding roughly 650 miles of trails in 18 states to the National Trails System. Today’s announcement comes in advance of National Trails Day on Saturday. The day features hundreds of organized activities including hikes, educational programs, bike rides, trail rehabilitation projects, festivals, paddle trips, and trail dedications across the country. National recreation trail designation recognizes existing trails and trail systems that link communities to recreational opportunities on public lands and in local parks. Communities and other partners supporting the establishment of the new national recreation trails receive a certificate of designation, a letter of congratulation from Secretary Jewell, and a set of national recreation trail markers. The national recreation trail program is jointly administered by the National Park Service and the U.S. Forest Service in conjunction with a number of other federal and nonprofit partners, such as American Trails, which hosts the national recreation trails website. American Trails is concerned that California might opt out of the Recreational Trails Program. Nevertheless, a California trail, the Nadeau Trail, is one of the 28 designated today as national recreation trails. 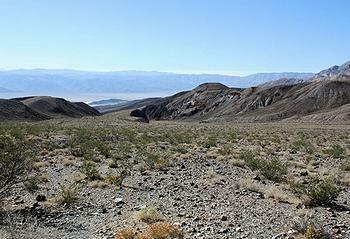 Located within a Bureau of Land Management Special Recreation Management Area on the east side of the Argus Range in western Panamint Valley, the Nadeau Trail offers opportunities for off-highway vehicle exploration, wilderness hiking, and packing opportunities. The 28-mile trail exists much as it did in the mid-1880s. Four wheel drive routes off of the trail provide access to desert canyons and steep mountain slopes with expansive views. The Coalition for Recreational Trails has developed the California Campaign to Save Recreational Trails and is lobbying Governor Brown’s office to ensure that he understands the scope of support for the Recreational Trails Program. 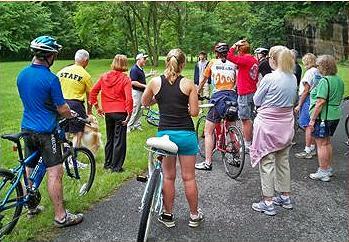 A listing of hundreds of National Trails Day activities is on the American Hiking Society‘s website. A California hike is featured among them. In the Los Angeles area, hikers can get a new view of the famed Hollywood sign by joining the LA Trail Hikers for a 6.2-mile round trip excursion from the Griffith Observatory to the top of Mount Lee. They will find views of the Hollywood Sign letters, Hollywood reservoir, and surrounding cities. Harvest Square Recreational Preserve Trail System – At the Land Trust of Alabama’s Harvest Square Recreational Preserve in Northwest Madison County, 2.3 miles of trail invite hiking, biking, running, nature viewing, and service. The preserve is inhabited by deer, turkey, raccoon, fox and beaver. Phenix City Riverwalk – The 1.2-mile Phenix City Riverwalk offers a 3,000-seat amphitheater overlooking the Chattahoochee River, tree-shaded sections and open areas. Turkey Creek Nature Preserve Trail System – Three nature trails totaling 2.13 miles in Pinson. The paved Highland Trail provides walkers and bicyclists a moderate climb through the Highland Forest; the easy Boy Scout Trail takes hikers along the banks of Turkey Creek; and the Thompson Trace offers wildlife viewing opportunities. Nadeau Trail – Within a Bureau of Land Management Special Recreation Management Area on the east side of the Argus Range in western Panamint Valley, the 28 mile Nadeau Trail abounds with off-highway vehicle, wilderness hiking, and packing opportunities for history seekers and desert recreationists. Junction and Breakwater Trail – In the southwestern side of Cape Henlopen State Park, this four-mile rail-trail follows a section of the former Penn Central Railroad between Lewes and Rehoboth Beach. Interpretive signs provide information about the area’s plant and animal life. Northern Delaware Greenway Trail – Brandywine Creek – The 2.5-mile section of the Northern Delaware Greenway Trail in Brandywine Creek State Park offers hikers views of Piedmont wooded landscapes, spring wildflowers, and wildlife, unique geologic features, and the chance to picnic, fish, and canoe along Brandywine Creek. Northern Delaware Greenway Trail – Wilmington – The 7.22-mile Wilmington section of the Northern Delaware Greenway Trail links existing parks throughout northern New Castle County between the Delaware River and the Brandywine River. Pomeroy and Newark Rail Trail – This 4.18-mile rail-trail connects Newark’s central business district, city parks, the University of Delaware, and White Clay Creek State Park. One million people live within 20 miles of the trail. Chipola River Greenway – Butler Trail – Owned by the State of Florida and managed by the city of Marianna, the Chipola River Greenway features unique rock formations, caves, sink holes, and wetlands. Rare habitats, plants, and animals thrive along the trails. The northern section of the greenway, the 3.5-mile Butler Trail, provides scenic views within the dense forest. Chipola River Greenway – Hinson Conservation and Recreation Area Trail System – Like the Butler Trail section, the four miles of trails in the Hinson Conservation and Recreation Area at the southern end of the Chipola River Greenway are maintained by the Florida Trail Association, Chipola Greenway Volunteers, and local Boy Scouts. Sugar Bottom Mountain Biking Trail System – Set in rugged terrain surrounding the Coralville Reservoir on the Iowa River, 13 miles of trail are arranged as a one-way system of loops to create an extended continuous riding experience and serve riders of all skill levels. Volksweg Trail – Volksweg is a Dutch word meaning “people’s path,” and this trail serves as a path connecting the city of Pella to the recreation areas of Lake Red Rock on the Des Moines River. The trail traverses timbered areas, restored prairies, pine plantations, and open fields with views of the lake. 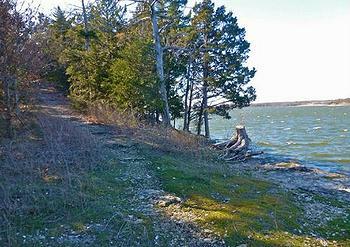 General Dacey Trail – This four-mile multipurpose trail at Lake Shelbyville is a premiere attraction for physical fitness, family gatherings, educational opportunities, and wildlife viewing. Timber Point – On the Rachel Carson National Wildlife Refuge near Biddleford Pool, a scenic 1.4-mile lollipop trail with an elevated platform takes visitors past freshwater wetlands, fringing salt marshes, cattail marshes, mixed deciduous forest, mudflats used by feeding shorebirds, coastal shrublands, rocky shores, and views of the Little River Estuary and Atlantic Ocean. Hellcat Interpretive Trail – At the Parker River National Wildlife Refuge on Plum Island, the two branches of the one-mile Hellcat Interpretive Trail meander through dunes, shrub thickets, vernal pools, maritime forest and brackish marsh habitats. Observation platforms and a mile of elevated boardwalk enhance wildlife viewing opportunities while protecting the habitat of this Western Hemispheric Shorebird Reserve Site. Over 120,000 visitors use this trail annually. North Eastern State Trail, NEST – Natural resources are abundant along the 71-mile trail, connecting Alpena to Cheboygan. The trail passes along lakes and ponds, crosses rivers and streams, and connects to Aloha State Park and thousands of acres of state forest lands. The NEST is part of the over 220-mile state rail-trail network in Michigan’s northern lower peninsula and is part of the state-designated snowmobile trail network. It is open to non-motorized use all year and to snowmobiles from December 1 to March 31. Pomme de Terre Multipurpose Trail – This U.S. Army Corps of Engineers trail, located in Bolivar Landing on the southern portion of Pomme de Terre Lake, provides enjoyment for horseback riders, mountain bikers, and hikers. The looped trail has several smaller loops, adding up to nearly 20 miles. Running River Trail – Located in Outlet Park just below Pomme de Terre Dam, this 3.1-mile looped trail meanders along the Pomme de Terre River and through a forest. Mud Pond Trail – On the Pondicherry Division of the Silvio O. Conte National Wildlife Refuge, visitors walk through a forest community uncommon to the Connecticut River Valley to a beautiful pond and a boreal forest fen deep within the refuge. Mud Pond is inhbaited by three carnivorous plant species and unusual wildlife for this part of New England. The 0.6-mile universally accessible trail has 900 feet of raised boardwalk with rest stops. Sierra Vista Trail – Built by the U.S. Bureau of Land Management, local mountain biking and running groups for mountain biking, hiking, and equestrian use, this 29-mile trail runs the length of the west side of the Organ Mountains near Las Cruces. The trail provides a safe, convenient, and relatively easy way to explore the Chihuahuan Desert. Kings Mountain Gateway Trail – The city of Kings Mountain has developed five miles of multipurpose trail for walking, hiking, and biking offering views of Kings Mountain and Crowder’s Mountain. 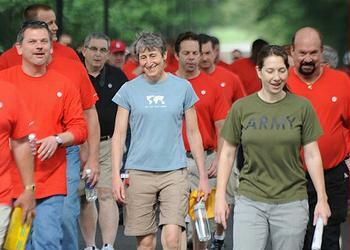 More than 12,000 walkers use the fitness loop in the trailhead park each month. Over $800,000 in trail easements were donated by four corporate landowners. Kiski-Conemaugh Water Trail – This 88-mile water trail runs through Cambria, Indiana, Westmoreland, and Armstrong counties. Once degraded by pollution from the industries that built the economic foundation of the area, the Kiski-Conemaugh is now recovering. Paddlers travel past historic sites such as the Johnstown Inclined Plane and the Conemaugh River Bridge, and through natural features such as the 1,560-foot deep Conemaugh Gorge as it cuts through Laurel Ridge. Three Rivers Greenway – One of the River Alliance’s greatest accomplishments is the Three Rivers Greenway, an America’s Great Outdoors initiative recently named by the Department of the Interior as one of the country’s most promising ways to reconnect Americans to the natural world. The trail covers six miles of pathways where the Broad, Saluda, and Congaree rivers meet in Columbia. Brownsville Historic Battlefield Trail – This nine-mile hike and bike path runs through the middle of Brownsville and ends north of the city at Palo Alto Battlefield National Historical Park. Trail users experience resacas, which are former Rio Grande River tributaries, palm trees, mesquites, and the wildlife of south Texas. 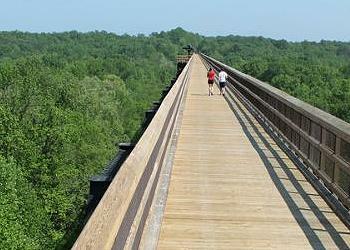 High Bridge Trail State Park – This 31-mile multiuse rail-trail in Central Virginia includes the majestic High Bridge, on the National Register of Historic Places and a Virginia Historic Landmark. At 2,422 feet long and 125 feet above the Appomattox River, High Bridge is the longest recreational bridge in Virginia and among the 10 longest recreational bridges in the United States. The trail is wide and level, making it easy to use by all ages and skill levels. Tobacco Heritage Trail – South Boston – Along this 2.6-mile segment of the Tobacco Heritage Trail in South Boston are scenic views of the Dan River, the remains of a cotton mill, the Prizery (once a tobacco warehouse, now a community theatre, museum, and events venue), Diamond Hill (a former slave cemetery), and Berry Hill Plantation. Fox-Wisconsin Heritage Water Trail – Stretching diagonally across Wisconsin for 280 miles from Green Bay in the northeast, through the city of Portage, and on to the convergence of the Wisconsin with the Mississippi River in the southwest, this water trail traverses 15 counties and more than 40 municipalities. The exploration route of Father Jacques Marquette and Louis Joliet, the trail celebrates how the Lower Fox, Upper Fox, and Lower Wisconsin Rivers have shaped the state’s history.